One of the things I love most about spring is how fresh and bright everything looks. It really gets me in the mood to spruce up our home and swap out winter textures and accessories for new spring ones. This definitely goes for my home office, as well. If I have to sit in there for hours each day I want it to be fun and uplifting. Most of the time I end up buying new desk accessories like pen cups, staplers, binders, and the like. Sometimes I’ll add new wall hangings or art, change out a lamp or lamp shade, maybe even add a new throw rug or hang new window treatments. Not only does it keep it current for the season and changes in weather it helps keep work feeling fresh and not so ho-hum. With all those changes it wasn’t until just recently that I thought about being able to accessorize with phones, however. I mean, a phone is a phone, right? You use it to place and receive (or screen) calls. You just want it to have the functions you need like be cordless, have caller ID, and maybe (probably) an answering machine. If you’re using it in your home office you might also want it to be able to handle conferencing people together on a single call. But just because something needs to be functional it doesn’t mean it can’t be fun. I’m loving that VTech feels the same way and has colored cordless phones in their line up. 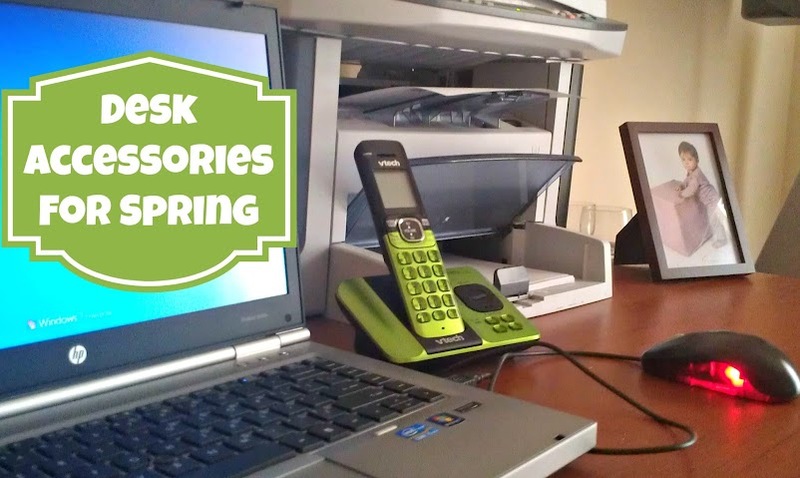 Their green phone is perfect for spring, whether it’s in a home office, the kitchen, the kids’ room, as a St. Patrick’s Day gift, or any reason, really. It has a digital answering machine and you can retrieve your messages right from the handset (love that feature). It also has DECT 6.0 digital technology, which is tech-speak for great sound and voice quality. You can even add up to four additional handsets on the same phone jack which is great for being able to stash phones in any location you might want to receive a call. Like out on the deck which is where I wish my home office was located. What is your favorite office accessory for spring? I received one or more of the above mentioned products in order to facilitate my review. No additional compensation was received and all opinions, as always, are 100% that of myself and my family. Originally published on 2013-03-15 by Liza at Views from the Ville .